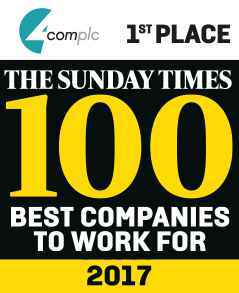 There are many great reasons why we were named as the winners of The 2017 Sunday Times Best Companies to Work For. Great career progression prospects, on-the-job training and development and some of the best benefits you’ll find are just some of the reasons why people love working here at 4Com. We are currently recruiting for the following roles. Click on the links to discover more about these exciting career opportunities and the amazing benefits package that comes with working at 4Com. We are looking for a developer to join our growing Cloud Services team, somebody who can hit the ground running and utilise the latest technology to create modern and reliable infrastructure for our products. We are engineering the next generation of our platform to support the in-house developed HiHi phone system. We work in an Agile environment utilising Microsoft Azure. We’re looking for a Test Analyst to work within one of our agile development teams creating enterprise systems and line of business applications. You’ll develop the testing frameworks and where appropriate introduce new tools with the goal to automate as much of the testing processes as possible. We’re looking for a Business Analyst to work across multiple projects and undertake multiple roles from requirements analyst to assisting with testing, training and making out of the box changes to the MS Dynamics CRM system. As a Business Administrator you will be responsible for undertaking all administration duties from point of sale through to project completion. You will have a keen eye for detail, ensuring that all sales paperwork has been completed fully and accurately. You will work with our external leasing companies, making sure they have all the information they need. You will be responsible for the invoicing of all Leasing Business to ensure payments are made in an efficient and timely manner. This will be a great role for someone who has previous experience in Accounts Administration and enjoys lots of customer and colleague interaction. As a Sales Administrator you will be responsible for undertaking all administration duties from point of sale through to project completion. You will have a keen eye for detail, ensuring that all sales paperwork has been completed fully and accurately. You will work with our external leasing companies, making sure they have all the information they need. You will be responsible for the invoicing of all Leasing Business to ensure payments are made in an efficient and timely manner. We’re looking for a number of Market Researchers. The Market Research team are responsible for conducting telephone surveys to gain accurate market research data on potential new clients. You will be making up to 300 call's a day, be researching companies via the internet and up dating the data you get using excel and our CRM. You’ll need to have a excellent attention to detail to ensure accuracy and be able to manage your time and workload to hit daily targets. When you apply to us, you'll need to submit certain pieces of information which we're committed to holding securely and privately. For more information, please click the button below.